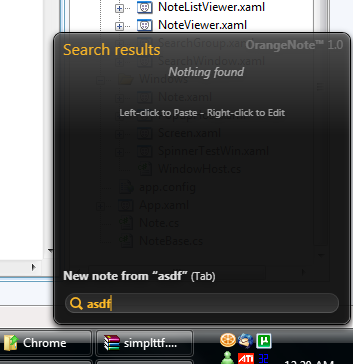 Based on some user feedback, I’ve given the note window in OrangeNote a bit of a makeover. Margins have been slimmed down and the text area is now clearly defined, separating areas cleanly and making things feel more in place. I’ve also added a “pin” function (not shown) that allows a floating note window to be temporarily turned into a normal window complete with a task bar button. OrangeNote is currently available for beta testing at Wakoopa. Take it for a test drive and get a free registration! 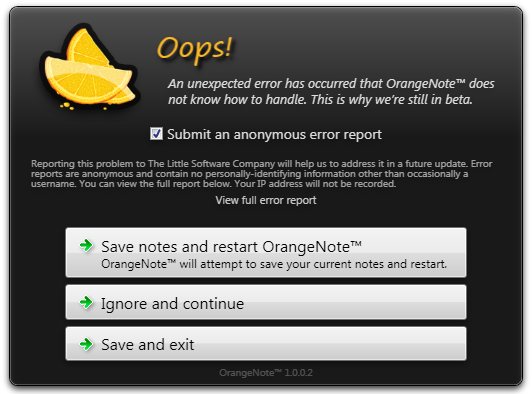 Just a quick post to show-off OrangeNote’s brand new crash recovery and reporting dialog. Ironically, this is something that you hopefully won’t be seeing when you run OrangeNote, but I’ve always found a friendly and elegant crash dialog to convey a sense of professionalism and polish on an application. If it’s going to crash, we may as well make it as pleasant an experience as possible. OrangeNote™ includes the same error reporting system employed by FeedBeast™, which anonymously logs and records all unhandled exceptions that occur in the program so they can be quickly addressed in future updates. As always, submitting crash reports is completely optional. OrangeNote™ is available for beta testing at Wakoopa, and anyone that gets involved in the project during testing will receive a complimentary license for their help. I know it’s not exactly the most popular blog (yet! ), but it’s my baby and I’m glad to see it has a home on the web again. Mind you I haven’t yet figured out how to import all my old data that I think I backed up from its last life, but I can always start fresh if I have to. Anyhow, I’m working on a cool new WPF-based Windows app called OrangeNote (based on the Mac app of the same name developed by a friend of mine), and I must say it’s looking good. So stay tuned for that. It’s gonna be great. What? You want to know what it does? Well I don’t want to give it all away, but it’s basically a system-wide repository for all your textual information, complete with a lightning-quick, full-text search engine that can be brought up with a global hotkey. You’ll basically never have to use a text file to jot something down again. On that note, it’s good to be back, and with any luck piHole will be around for a lot longer this time around!